As a third generation of Barcelona restaurateurs, Alejandro Pages comes from a tradition of serving royalty and commoners. His grandfather used to serve the Duke and Duchess of Barcelona and his family has had over twenty restaurants in Spain. Alejandro fondly remembers being in one of the restaurants before he could walk. “I sat in the kitchen and ate chips,” he shared with me recently when I dined at Little Spain in the Farmers Market. I bet it was exciting for this little lad to watch chefs prepare food and servers whisk the dishes away to guests in the dining room. “When I was ten-years-old, my family taught me how to make Crème Catalana. I’ve been perfecting it for the past 27 years,” boast Pages. While on vacation in California, Pages fell in love and married an American girl. He wanted to open a restaurant to support his new life with a wife. After studying Operations and Business of the Restaurant Industry at UCLA, Pages learned how to run a restaurant in America and opened Little Spain two months ago. 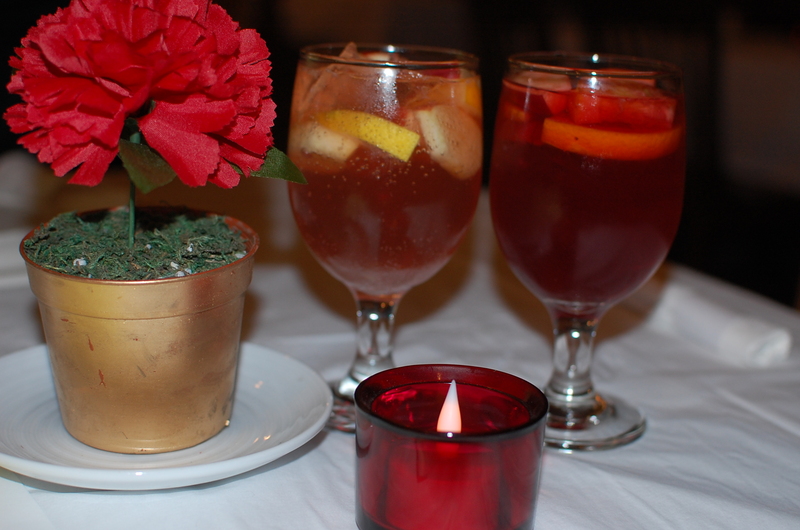 Sitting on the heated patio facing Third Street, we enjoyed authentic Catalonia and Valencia recipes from his family. The flavors brought back fond memories of our visit to Barcelona last summer. Alejandro cooks in the true Spanish style, slow cooking with the finest ingredients. Our server, Belen (born in Spain), landed this job by going to a Facebook site for Spainards in Los Angeles. Pages announced the opening of his restaurant; Little Spain, and Balen contacted him for an interview and was hired immediately. She feels a sense of family working here. Our dining adventure started with a glass of their white sparkling sangria with apples and oranges and various tasty Tapas. “The Albondigas en salsa, tastes just like the meatballs my family made at home,” Belen shared with a smile. “Alejandro’s great grandmother made this recipe and he follows it exactly,” stated Belen. The firm meatballs cook for hours in a scarlet red tomato sauce with onions, soft sweet peas, carrots and potatoes. It’s exquisite, better than most of the meatballs served in Spanish kitchens. We also enjoyed the bite-size Croquetas Espanolas with chicken. Served with fries, they are not like the South American croquetas filled with rice or potatoes. This tapa is cooked very slowly with vegetables and chicken, then breaded and fried. Another favorite tapa was a dish of little shrimps coated with garlic, paprika and red pepper. Not too hot in flavor, but the red pepper and paprika gave it a little pizzazz. 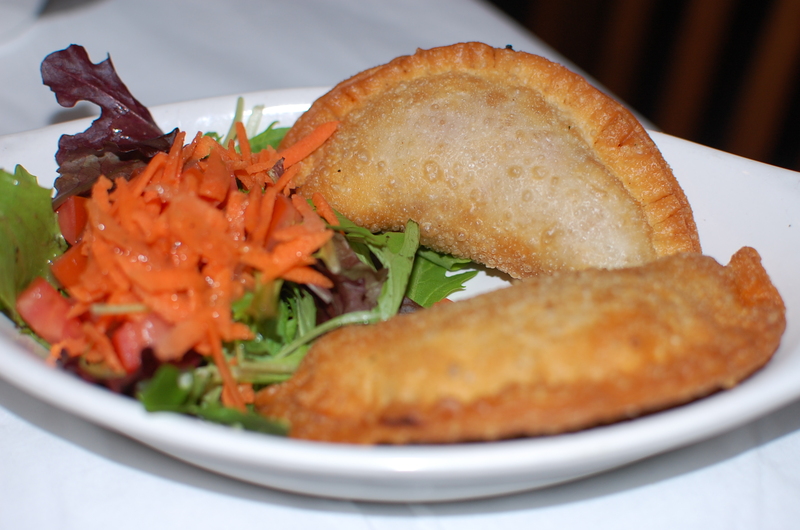 The Bombas are fried potato balls filled with spicy meat and the charming Empanadas are served with a side salad. All the tapas were an excellent value at $4.50 each. Another pleasing appetizer that accompanies the refreshing sangrias is the Montaditos; small bites of bread with “something on top.” Pages places divine dried cured Spanish ham, dried cured meats, and Spanish cheeses that he imports from his home country. Three Montaditos are $4.5 and five are $7. If you love the taste of these Montaditos, Alejandro sells over 14 varieties of Spanish cheese and dried cured meats in his store attached to his restaurant. Another good value is the seafood Paella for $12. It’s large enough to share with two to three people; depending on how many tapas you nibbled on first. The dish arrives with a mound of saffron rice, clams, mussels, scallops, calamari, shrimp and vegetables. 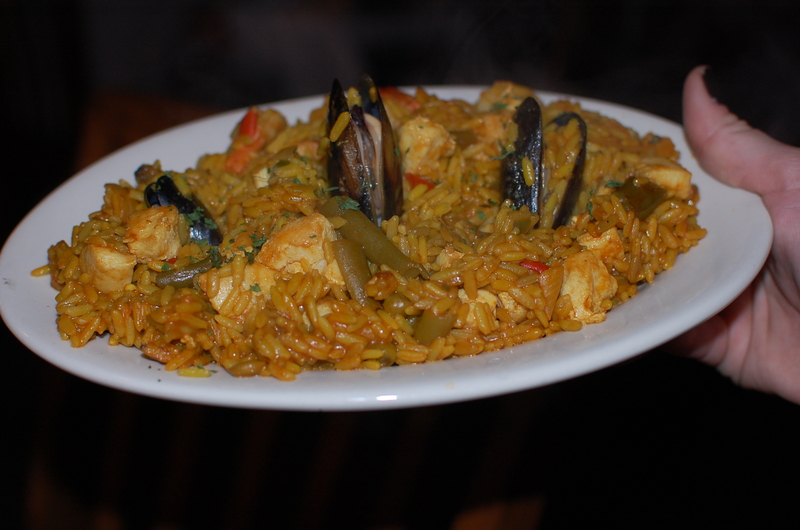 The Paella Valencia offers chicken, mussels, shrimp and vegetables and the vegetable Paella is 100% vegan. Little Spain offers a nice selection of Spanish wines. We had a glass of a delightful red, Tapena Garnacha and a hearty Valdubon Crianza with our paella. For dessert we had to try the Crema Cataluna. It arrived looking like a crème brulee, yet with a sweeter and creamier vanilla custard. Pages stands firm on providing authentic Spanish food in a casual and comfortable setting. His dishes are similar to what his great grandfather presented to royals many years ago. Published in the Beverly Press 1/20/11 via Little Spain.